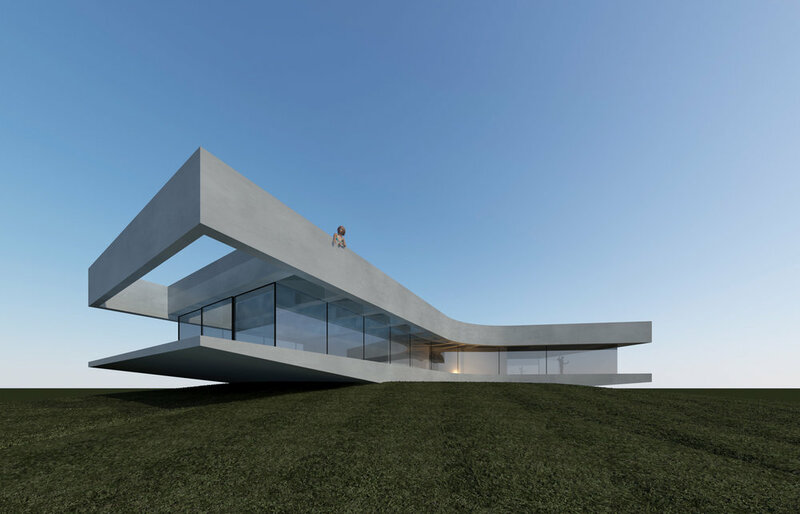 The concept of the residence starts from a horizontal concrete plateau that cantilevers against a concrete conical wall. Underground, on the other side of the wall, two hidden rooms with patios provide a counterweight to the horizontal plateau. 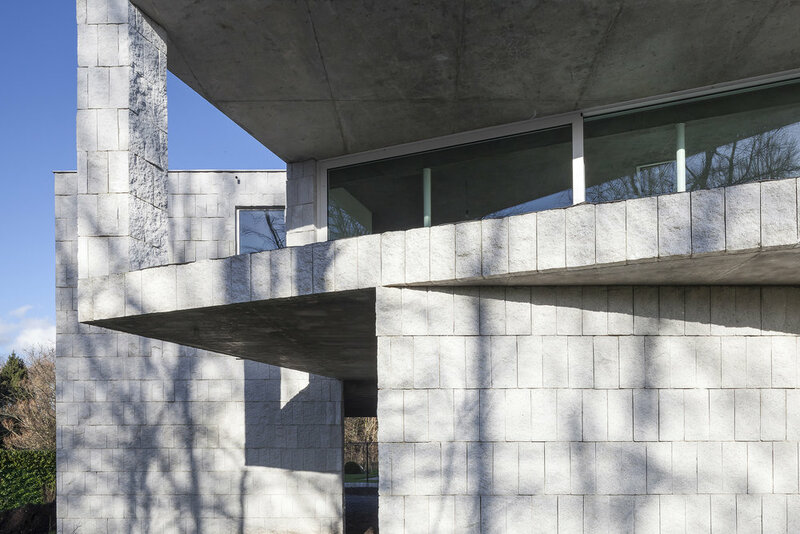 FINALIST WAF AWARDS "Best Building of 2017"
Located in Rupelmonde, in a park of 3.5 hectares on the banks of the river Schelde, a dynamic sculpture comprises a villa with an office space and a maisonette. By interpreting it as a bridge-like structure, since the ground is in floodplain, residents enjoy the spectacular panoramic views over a nature reserve, while they dominate their entire property. The flowing shape of the building renders the logical structural answer to the bridge-concept. Rooftop extension and renovation of a fifties apartment block in the historic city center. Single family house on a sloped plot between two roads overlooking a protected nature reserve. 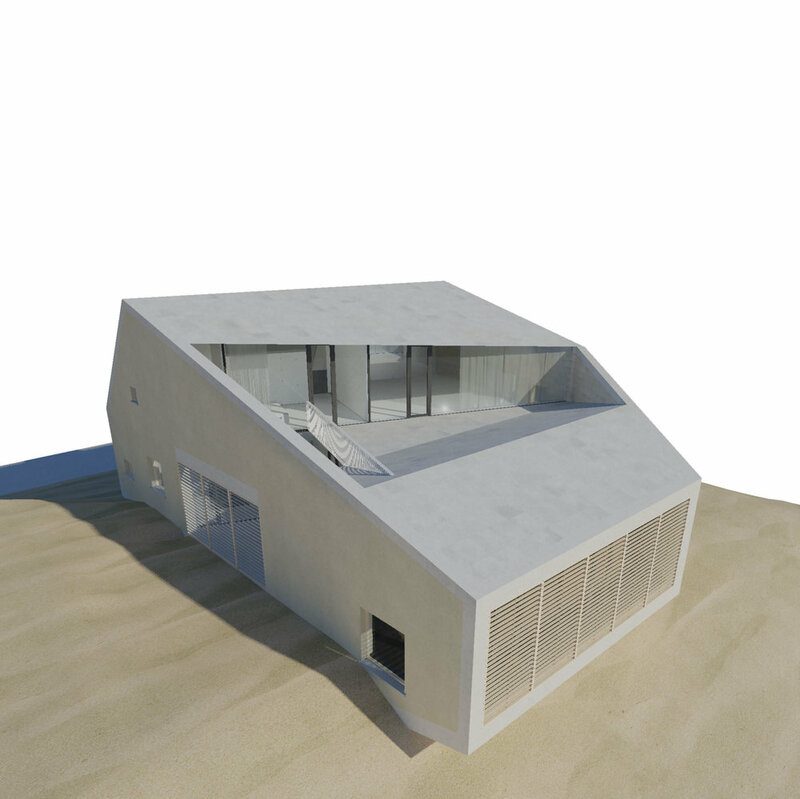 On the one side the house looks like a typical traditional Flemish house with a gable roof, while from the other side it is cantilevered above the slope to create an impressive view of the dunes. Single family residence on a large remote terrain with its own lake in the French Périgord area. By laying the two horizontal plateaus (with seemingly only glass in between) on the landscape, there is no barrier between the indoors and the outdoors. Choosing a material that matches the soil also intensifies the feeling of merging with its enviroment. This in contrast with the orthogonal lines that clearly define an intervention in the scenery. Renovation of an apartment on the second floor of a typical fifties apartment block, alongside the "Leie" river in the historical center of Ghent (BE). 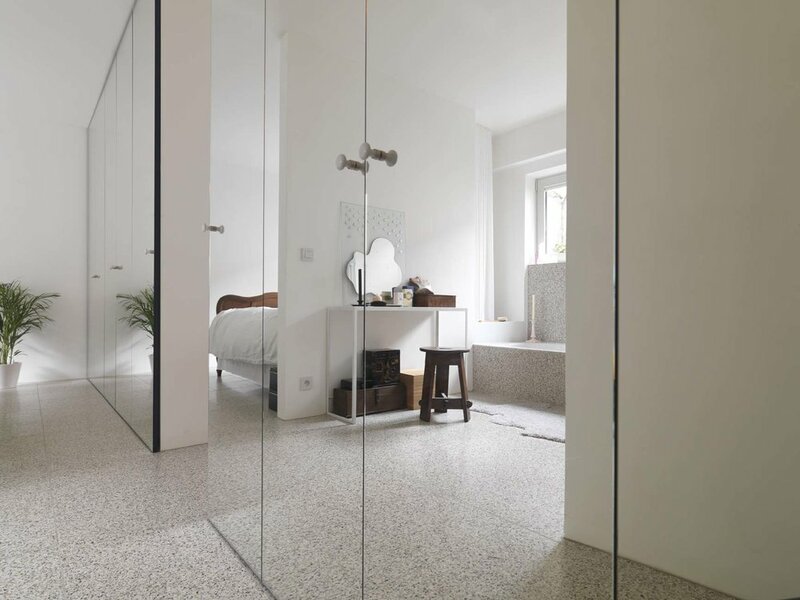 Mirrors are choosen as a finishing material for the built-in cabinets. They give the apartment a timeless luxurious feel, they double the width over the whole length of the apartment and enhance the light influx. House QM answers the building regulations in a different and "twisted" way. House QM is a single family home situated in a new allotment that exists out of square plots of the same size with the same building regulations; houses must recoil 5m of every side of the terrain, have 2 levels and can have a flat or sloped roof. This house puts a twist on things. Eccentric villa with a panoramic view of the surrounding and the golf course in particular. The structural concept finds its origin in a balanced cantilever. Holiday home on a sloped plot. Briefing: Tape à l'Oeil in prefab concrete panels (1). 2 summer houses with perfect views. Side by side, seemingly similar but different. How do models, sports people, and dancers cope with the pressure of constantly performing and staying at the top of their discipline? What can they teach us and can we achieve the same?